...and maybe it will stop growing. This apple was indeed huge! She's laughing all over:-) Such a cute portrait. That apple seems so huge! Stunning picture! A new twist on perspective with portraits. Creative. Classy glow as always. Very well done. The color and tone of this image is spectacular. Thank you for sharing. Beautiful dof, the fruit looks much bigger in these little hands. great, I really likes the colors/tones! Love this -the perspective adds so much. Lovely shot. You captured her excitement and the remarkable thing about children, it's not the material things that matter. A simple apple and love is all that's required. Great picture. So expressive, just sweet! Her expression, size scaling, dof, tonal and color range makes this photo masterpiece! Brilliant! You really captured something special and unique in this shot! Hopefully you'll have posters of this one for sale soon as I'd really like to hang it up in my classroom! I like foto but why you let you childs eat bad not natura food?!!! Apple with genetics from bad things put in and make childs sick! Real apples small and taste good so no need fake big fruta!! This is the kind of photo that's bound to bring on the smiles for years to come. Nice work! 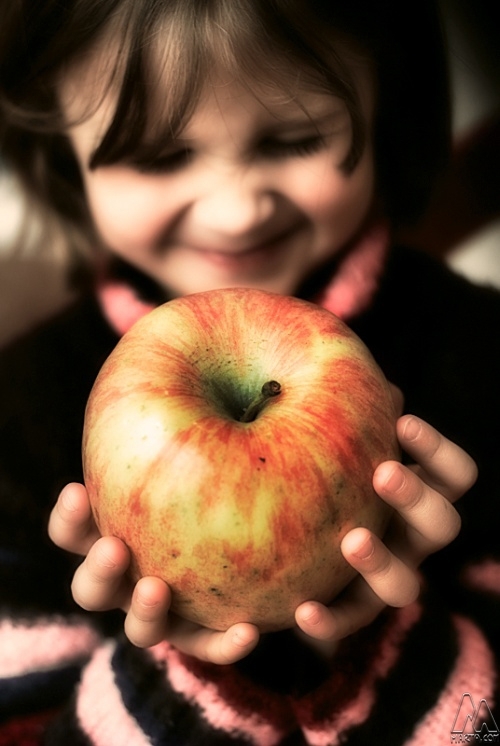 fantastic portrait of both the child and the apple! :) Great shot! Crazy color in the apple. I love your work. Keep it coming. I have a big appetite. How cute , we are protectors of these little ones! What a contrast in her expression from the one where she looked so sad. Kids are like that:-) Exceptional image. AAh! I just love that look on her face -brilliant capture of expression in animation! A fantastic capture. The perspective and the size of the apple in relation to her face makes this very special. And by moving her face out of the focus the apple is pronounced. Excellent!!!! Que gran foto, me encanta la composici�n y el tratamiento que le has dado. Un saludo. I wish I had time to comment on all your photos. You have some really, really wonderful work here. I have to say that I am really impressed and looking forward to when I have a bit more time to browse. Felicidades por tu nominación en Photo Friday! Me gusta mucho esta foto.